To select the folders to lock, click the Add button. All the folders you add to the list will be protected with the same password. If you wish to protect two separate folders with different passwords, you need to run folder Password Expert twice adding each time only one folder to the list and then entering its unique password. To exclude a folder from the list, select the folder and click the Remove button. In this case, Folder Password Expert will not password protect the folder—anyone who uses your computer will be able to access it. Some folders I selected were not included in the list. What's wrong? 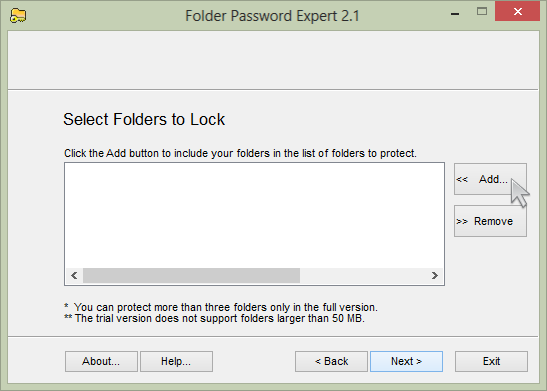 Folder Password Expert protects folders including their subfolders and files. For example, let's say the My Documents folder includes the folders called Folder One and Folder Two. Both Folder One and Folder Two will be locked if you lock the My Documents folder. If you added the My Documents folder to the list of folders to protect, you do not need to add Folder One and Folder Two. Why are some folders excluded from the list? If you add a subfolder to the list of folders to protect and then add the root folder, the subfolder will be excluded from the list. The subfolder will be password protected as a part of its root folder.